Over 600% pipe network to liquid volume, allowing massive piping networks. Longer distance from cylinder to nozzle both horizontally and vertically enables more options on cylinder placement. 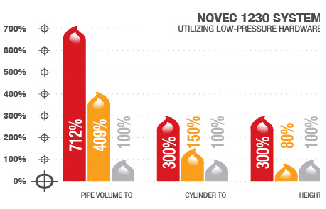 Using low pressure hardware achieving high-pressure performance, yielding lower overall hardware and installations cost.